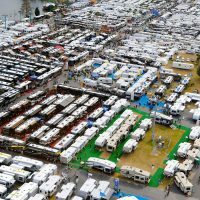 After investing 10’s or 100’s of thousands of dollars on your RV, the last thing you want to worry about is replacing high-priced electrical appliances such as A/C units, refrigerators, or microwave/convection ovens – not to mention all the other electrical components and wiring that make your RV work. That’s why we recommend that every RVer invest in a quality RV surge protector or electricity management system. 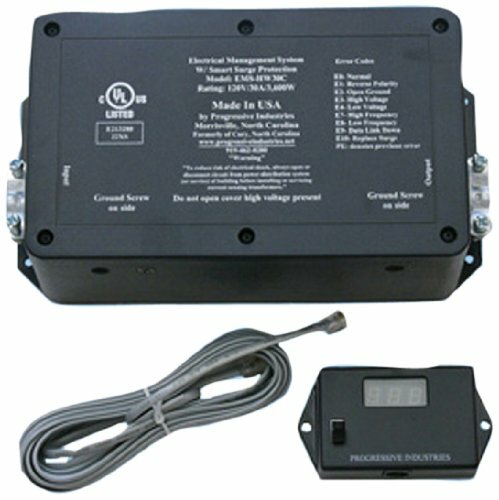 The Progressive Industries EMS-HW30C and EMS-HW50C Electricity Management Systems are permanently hard-wired solutions that protect your RV from power surges, voltage drops, improperly wired RV park posts (reverse polarity, open neutral, open ground, & 240V) and even include a remote display so you can monitor your power usage in real time. We ordered our EMS-HW30C the day we bought our RV, and recommend that everyone else do the same. Once installed, you’ll never have to worry about power surges, voltage drops, or poorly wired power posts again. As an added bonus it’s hard-wired and can be installed in your electricity compartment, so you don’t have to worry about someone stealing your expensive surge protector from the post while you’re away from your RV or asleep. All Progressive Industries EMS units include a lifetime warranty. 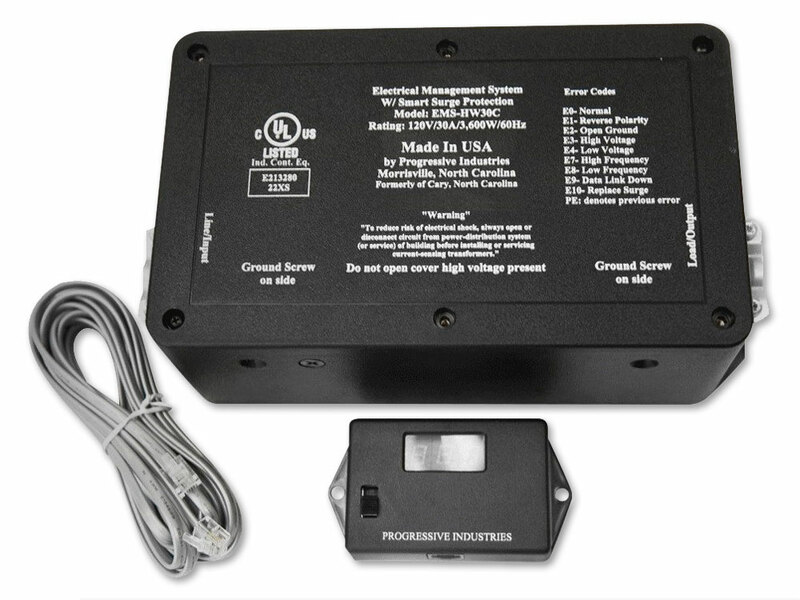 Welcome to our review of the Progressive Industries 30 Amp Electricity Management System with monitor. This review also applies to the 50 Amp Electricity Management System, as the two systems are essentially the same. Note that the Progressive Industries EMS is NOT an Energy Management System. RV Energy Management Systems actively control power distribution between the many energy-hungry appliances in higher-end RVs, including their up to 4x A/C Units, Washer & Electric Dryers, Electric Fireplace/Heaters, Dishwashers, etc..
Why Buy a Progressive Industries EMS for your RV? By their nature, RVs are promiscuous. Under normal usage they get plugged into a lot of different outlets. Like all things that ‘get around’, proper protection can be the difference between escaping from a bad hookup unscathed, and causing damage that can take hundreds or thousands of dollars to repair. 1. Reverse Polarity – This means the ‘hot’ wire has been wired to the neutral side of the plug, and the neutral wire has been wired to the ‘hot’ side of the plug. 2. 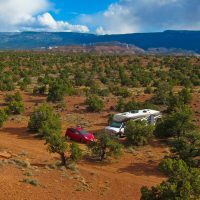 Open Ground – If the plug hasn’t been grounded properly, it increases the chance that your plug can melt (sometimes causing a fire) or that your RV can become electrified – which can shock or even kill you. 3. Open Neutral – This means that the neutral wire is disconnected, but the ‘hot’ wire is connected. You won’t run into this unless the pedestal is really old and hasn’t been used in a while. Normally this outlet won’t work in the first place – but it is possible for power to circulate through the hot wire and back through the ground. 4. 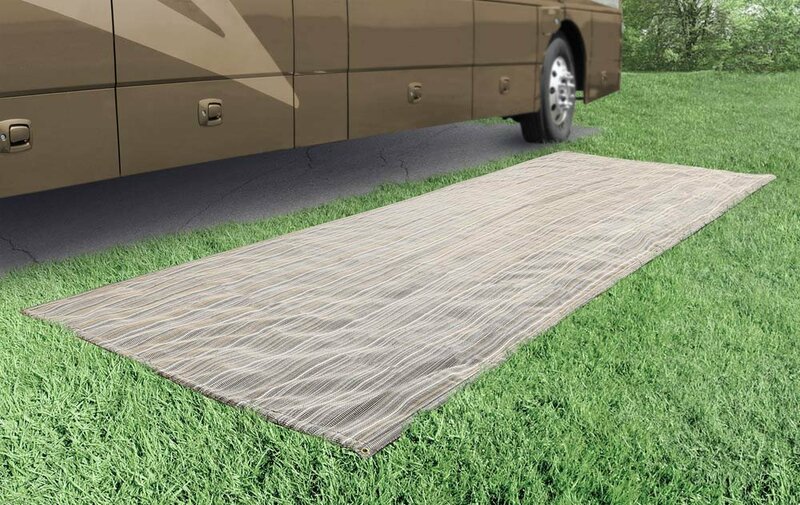 AC Frequency Protection – in the event that the power frequency is fluctuating, the EMS will shut down the power in the RV. 5. 240V Protection – You’re more likely to run into this when plugging into a 50amp outlet, as 50amp is 240V split into 2 legs, so it nets as 2 legs of 50amp power at 120V. If the 240V is all running through one leg, it could do a lot of damage to your RV. What Else Does the Progressive Industries EMS Do? Lightning can do a lot of damage to an unprotected RV! In addition, The Progressive Industries Electricity Management System (EMS) operates as both a surge protector and a real-time voltage monitor, while also giving you a real-time amperage usage readout. At a minimum, we recommend protecting your RV with a surge protector. A good surge protector will protect your electronics from power spikes, and it’s important to protect your RV from power surges! We met a couple in an Airstream who had a bad experience with power surges. They were in an RV park that was struck by lightning. 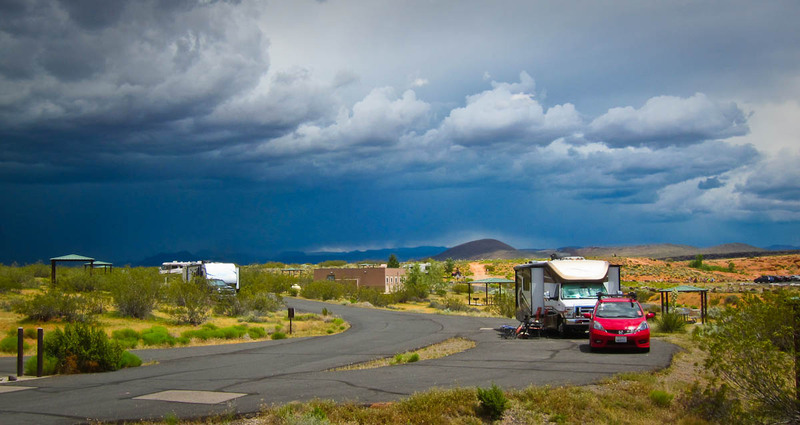 Note that their RV wasn’t struck – lightning struck near them. As they had no surge protector, a massive surge of electricity went through the campground wires and right into their trailer. Unfortunately most of their electronics were fried, including their refrigerator! Most warranties won’t cover damage due to power surges, so they had to pay to fix everything out of pocket. A surge protector could have saved them thousands of dollars and several days of having their RV in a shop. 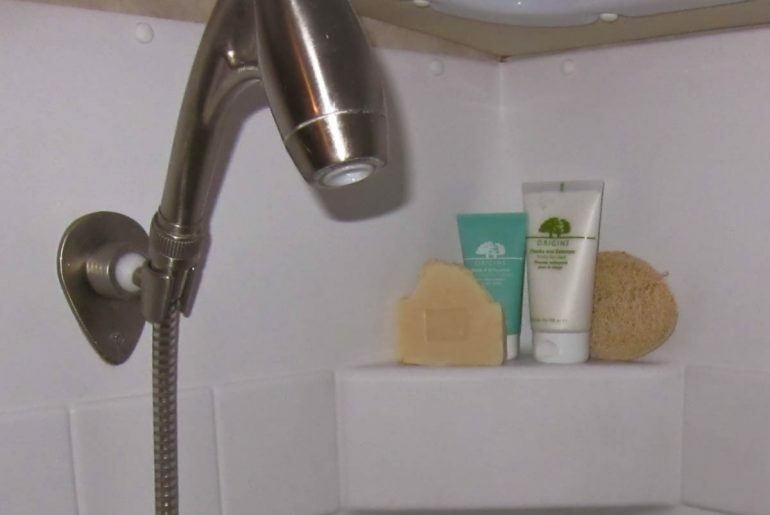 If you live in your RV full-time, you know just how disruptive, stressful, and expensive this can be. Don’t let this happen to you! What If I Only Want Surge Protection? 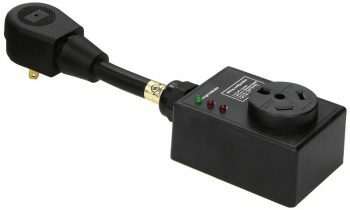 A Surge Protector will protect your RV from all but the most severe power surges by quickly cutting off the power supply to your RV when a surge is sensed. This is a great start, and is what we would consider ‘bare minimum’ protection for an RVer. If you’d rather not pay for the full Electrical Management System, then at the very least buy a surge protector! The Progressive Industries SSP30 Smart Surge (30amp) and SSP50 Smart Surge (50amp) are the best options for basic Surge Protection and the 30-amp unit is less than $100 while the 50-amp unit is slightly more. These units also check for reverse polarity, open nuetral, and open ground – all potentially big problems that can result from old decaying wiring or mis-wired plugs at the post. Technology Research (TRC) also makes surge guards that cost more than twice as much as the Progressive Industries products. Some people swear by them, but I’ve read enough negative reviews about product failures, as well as poor customer service and warranty issues that we can’t recommend them at this time. 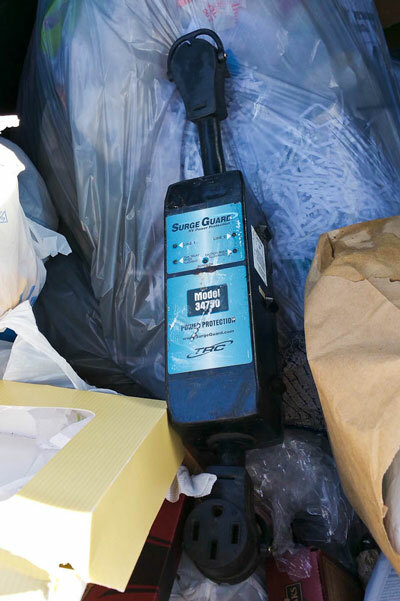 We also recently saw this TRC unit in the trash at one of our RV parks – and that simply doesn’t bode well for something that costs more than $200 and should provide years of service. TRC claims they have a warranty, so this product should never end up in the trash – And no, this isn’t a staged picture. All Progressive Industries products have a lifetime warranty, so they can be returned to the manufacturer for replacement if defective – never thrown away! The remote display is especially useful when plugged into 30amp service as it’s relatively easy to use more than 30amps (one A/C + Elec Water Heater + TV – or two A/C units + anything). By monitoring power usage with the Progressive Industries EMS, you’ll quickly learn how many amps each appliance draws, so you can safely stay below the max rating at the post and prevent tripped circuit breakers. The remote display also shows current voltage. If you mount the display somewhere visible, you can watch the slight voltage drop as you turn on your microwave or A/C. It’s especially interesting to keep your eye on voltage in the summer when everyone is running their A/C. 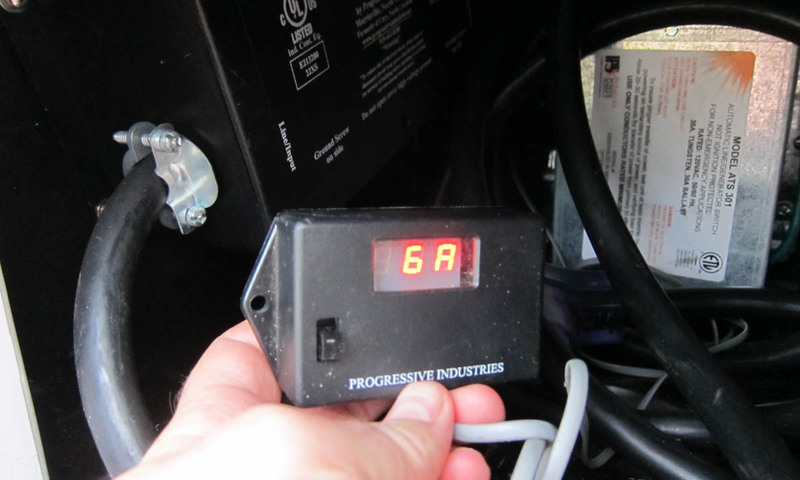 If the voltage drops below 104V, the EMS will cut power to your RV. This is because high-draw electronics like your A/C will pull higher charge at lower voltage. This can cause excessive heat which can literally fry your A/C unit. Not good – and another benefit of installing the EMS. The remote display also shows error codes in the event you lose power, so you can tell what happened after the fact. Last but not least, the remote has a bypass switch that allows you to turn the EMS ‘off’. Note that when the EMS is off, it still acts as a surge protector. All this does is turn off the active voltage monitoring. 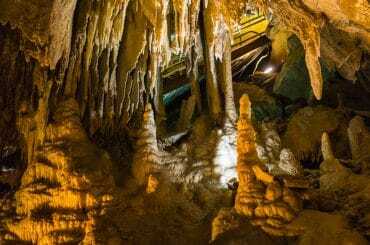 A little pricy – but not compared to your RV! The Progressive Industries EMS is an inexpensive way to protect the large investment you have in your RV. Power surges can cause a lot of damage in a hurry, and a unit like the Progressive Industries EMS gives you peace of mind you can’t get any other way. Our RV has been protected since day one and we recommend that you do the same! A Note About Installation – While Rich installed our EMS-HW30C himself, we strongly recommend that you hire a professional if you’re uncomfortable working with wiring and electrical systems. This is a fairly easy install, but if installed incorrectly it could lead to damage to your electrical systems, fire, or electrical shock, so proper installation is very important. Hi, I'm Rich - Perpetual traveler, photographer, writer, and web designer. To contact me, visit my site - www.richkent.com. Thanks for reading, and happy trekking! I’ve been told by the park maintenance guy that my EMS P50 is consuming volts thus causing low voltage. I have a basic understanding of residential power grids (Army engineer who designed and built multiple remote bases including power). I don’t see how this can be true, but am trying to find an authoritative opinion on it. I would think the power from the pedestal passes through (having been measured) and provides all power available at the pedestal to the RV. Hi John – you can ask Progressive Industries about this directly, but the short answer is no, the PI EMS does not cause voltage drop – and your understanding of the way it works is correct. Longer answer – Any voltage drop would be too small to measure (much like measuring line voltage or amperage with a multimeter). If the EMS were causing low voltage on it’s own, it would be a useless product. 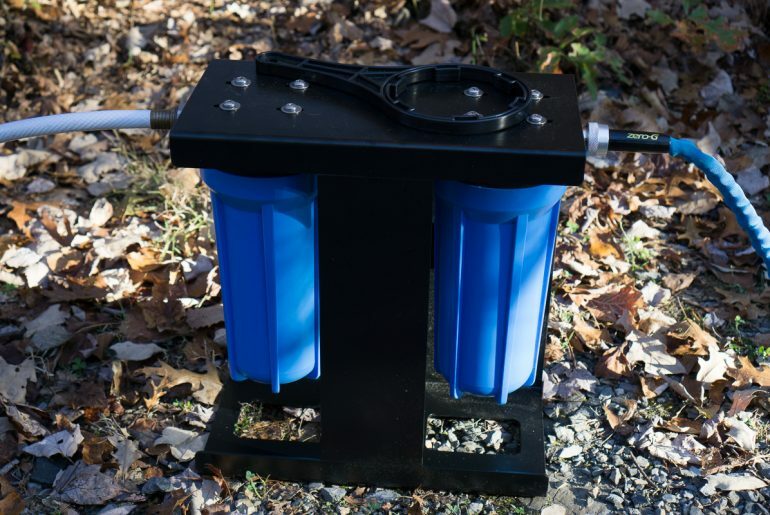 The EMS only cuts power when voltage drops below 104 and the park voltage at the pedestal should be around 120V. Is the maintenance guy trying to argue that the EMS caused a 16V drop? Because that’s silly. What usually causes this is a campground with older wiring plus it’s hot outside, so everyone is running their A/C. If you’re toward the ‘end of the line’ so to speak (further from the power source) then all the power usage + old wiring = voltage drops, especially as A/C compressors cycle on and off. We’ve had this happen at some parks and it’s not fun. I’d recommend moving to a different campsite if possible – good luck! TrekWithUs.com is a participant in the Amazon Services LLC Associates Program, an affiliate advertising program designed to provide a means for sites to earn advertising fees by advertising and linking to amazon.com, or endless.com, MYHABIT.com, SmallParts.com, or AmazonWireless.com.